By Terence Cavanaugh and Jerome Burg from ISTE press. With books, your students can travel the world―exploring faraway places and meeting people from different cultures. With bookmapping, they can use technology to virtually expand their understanding of the locations they visit and connect literature with geography, social studies, and more. Bookmapping allows students to plot the locations of a story on an interactive map, adding multimedia and hyperlinks about the setting, characters, and plot. They can add a photograph of a historical figure or an audio clip of regional music. And maps offer much more, helping students see places in the book up close―the vastness of the ocean their hero must cross, or the density of a city that hosts colorful and varied characters. In Bookmapping: Lit Trips and Beyond, Cavanaugh and Burg show you how this dynamic, interactive activity is a cross-curricular tool that helps students not only develop a better understanding of places, cultures, and the books they are reading, but also make connections among the subjects they learn in school. The authors explain how to create bookmaps, how to use existing ones, how to use them for creative writing, and much more. In addition, they provide instructions for mapping programs including Google Earth, share a few sample lesson plans, and discuss classroom management so you can start bookmapping whether you have one computer in your classroom or a computer for every student. Booktalks, booktalks, or booktalking, are the process creating short "commercials" about books which are presented by librarians, teachers, or students in elementary through high schools, libraries, or even people just get together, way to entice others to read a book. 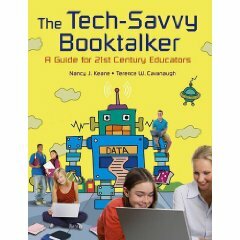 The Tech-Savvy Booktalker is designed for educators (k-12), technology support persons, media specialists, special education personnel, and reading/literacy instructors/coaches, this educator's guide is a combination reference, strategy guide, and tutorial for teachers about integrating, enhancing, and supporting booktalking with technology. The book provides strategies, instructions, and ideas for using booktalks as teaching and learning tools at all grade levels and in all content areas. Included are instructions for making digital booktalks to use with students, instructions for using existing school technology to create booktalks, and applications for using digital booktalks within the classroom and media center. Available from Libraries Unlimited and from Amazon.com. Literature Circles Through Technology by Terence Cavanaugh (2006). The rapidly increasing availability and low cost of e-book technology makes it ideal for schools and educators looking to expand their resources for readers. This book introduces the unique features that have established e-books as a powerful, effective learning tool for all grade levels and for special needs students. The book includes descriptions and illustrations of the most popular e-book platforms and programs, as well as dozens of practical ideas for using e-books for reading instruction, personal productivity, and curricular enrichment. Brimming with interactive lesson ideas, teaching tips, and online resources, this book is a must-have for teachers in all content areas and library media specialists. Available from ISTE Bookstore and Amazon.com. Teaching Science with Science Fiction Films: a Guide for Teachers and Media Specialists 2nd Edition, by Terence Cavanaugh and Cathy Cavanaugh (2004). Book Chapter: Distance learning as a form of accommodation, in Cavanaugh, C., Ed. 2004. Development and Management of Virtual Schools: Issues and Trends . Hershey, PA: Idea Group Publishing. Cavanaugh, T. 2005. Online Learning as a Form of Accommodation chapter in the Encyclopedia of Information Science and Technology, Edited by Mehdi Khosrow-Pour, D.B.A., Idea Group Inc. Hershey, PA.
Cavanaugh, T. 2004. Distance Learning as a Form of Accommodation chapter in Development and Management of Virtual Schools: Issues and Trends. Edited by Cathy Cavanaugh, Idea Group, Inc. Hershey, PA.
Cavanaugh, T. 2005. “Technology and the Read Aloud.” Florida Reading Quarterly V41 N2 pp. 2005. Cavanaugh, T. 2005. EBooks: Expanding the School Library. Library Media Connection. Linworth Publications. February 2005. pp 56-59. Cavanaugh, C. 2004. "Distance Learning Success Factors in the Resources-Processes-Results Cycle and Virtual School Accreditation" in Development and Management of Virtual Schools: Issues and Trends. Hershey, PA: Idea Group Publishing. Cavanaugh, T. 2004. "Online Picture Books - Reading Resources for all Ages and Classes." Florida Reading Quarterly V40 N3 pp. 32-35. Cavanaugh, T. 2003. "Using MS Word to Support Reading." Florida Reading Quarterly V40 N2 pp. 30-32. Cavanaugh, T. 2002. Assistive Technology: Tools to Improve Instruction. Florida Educational Leadership. Fall 2002, Volume 3, Number 1. Cavanaugh, T. & Cavanaugh, C. 1996. Learning Science with Science Fiction Film. Kendall-Hunt. "Web Page Evaluation for Education", paper published in the proceedings of WebNet 2001. "An Introduction to Assistive Technology Online" presented at International Conference on Higher Education Teaching and Learning (ICHETL), April 2001, Jacksonville FL. Co-author of "Standards of Practice Online Workshop"
Co-author of "Comparison of face-to-face and online instruction for introduction to educational technology courses for educators"
Co-author of "Effective Presentation Design" presented at SITE Orlando, March 2001.
published in the proceedings of National Educational Computing Conference (NECC), Atlanta, GA, 2000. “Interactive PowerPoint for Education” published in the proceedings of Society for Information Technology and Teacher Education (SITE), San Diego, CA, 2000. “Digital Cameras for Math and Science” (co-author) published in the proceedings of Math Science Education and Technology (MSET), San Diego, CA, 2000. “Web Enhanced Professional Development for Educators” published in the proceedings of WebNet, Hawaii, 1999. “Effects of Using Repurposed Science Rich Feature Film in Middle Grades Science” (author) published in the proceedings of Instruction International Conference on Technology in Education (ICTE), Tampa, FL, 1999. “Baking a Magnetic Field Display” (co-author) in The Physics Teacher, February, 1998. “Digital Cameras in Education,” presented at the International Conference for Technology in Education in Oslo, Norway, 1997. “Alginate Option Letter” in Journal of Geologic Education, October, 1997.